US Food and Drug Administration (FDA) is about to approve cloned meat and milk for the market. But a large coalition of civil society organizations is opposing the decision on both safety and ethical grounds . The coalition is led by the Center for Food Safety based in Washington DC, and includes the Humane Society with nearly 10 million members, and the Consumer Federation of America with membership of more than 50 million. A recent poll commissioned by the International Food Information Council (a non-profit organization supported by the food, beverage and agricultural industries) found nearly 60 percent of respondents would not touch products from cloned animals with only 9 percent “very likely” to buy them. This compares with 40 percent who would not buy genetically modified animal products. In preparation for FDA's approval of cloned animal products, the agency published a ‘commentary' in the January 2007 issue of Nature biotechnology  supported by a ‘perspective' piece on risk assessment, co-authored by scientists from at least two cloning companies . Both papers put the same misleading positive gloss on cloned animals. The FDA paper explains why cloned meat and milk are as safe as the conventional products, because “there are no unique risks associated with animal cloning,” while the risk assessment commentary cites the FDA paper in agreement. Neither paper considers ethics or animal welfare. Both papers present somatic cell nuclear transfer cloning (SCNT) reassuringly as the latest development in a “continuum” of artificial insemination, multiple ovulation/embryo transfer, in vitro fertilization, embryo cryopreservation, cloning by embryo splitting, and since the 1980s, by embryonic cell nuclear transfer (ECNT). First of all, it is highly misleading to pretend that clones obtained by nuclear transfer are the same as clones obtained by embryo splitting. The latter is typically done at the 2-4 cell stage, and is not so different from the twins or multiplets that happen naturally from time to time. Nuclear transfer cloning involves introducing the nuclei of embryonic cells (in ECNT) or adult somatic cells (in SCNT) into unfertilised eggs that has had the egg nucleus removed. The reconstituted eggs are then activated to develop, and the resultant embryos are implanted into surrogate mothers hormonally synchronized to receive them. Nuclear transfer cloning, especially SCNT results in extremely high failure rates from deaths and gross abnormalities, so much so that scientists speak of a “cloning syndrome” that arises from errors in epigenetic programming of the cell nucleus [5, 6]. The individual symptom may not be unique, but the combination and the high incidences of the symptoms certainly constitute a unique syndrome. It inflicts massive deaths, suffering and distress, not only to the cloned foetuses and the calves throughout gestation, at and after birth, but also to the surrogate mothers . Surrogate mothers frequently die from difficult delivery unless medical intervention is given, and their health is seriously compromised by gross malformations of the foetuses. Admittedly, many deaths and gross abnormalities occur in animal cloning, but the companies claim that those clones born alive and survive the perinatal period are healthy . To support their case, they tabulate nine studies, eight published elsewhere and one described in their paper, showing that the milk and meat products from clones are indistinguishable from controls, according to compositional studies on proteins, fats, somatic cell count, amino acid composition, vitamins, minerals etc, as recommended by the FDA . Had the FDA recommended more discerning tests similar to those now routinely used in the laboratory for DNA, RNA, protein and metabolic profiling, large numbers of differences would have been detected, as SCNT clones are notorious for epigenetic errors that result in major changes in DNA markings, RNA and proteins expressed (see below), and it would be surprising if these did not result in metabolic differences. By any standards, these data are grossly inadequate to establish the safety of cloned meat and milk or any other cloned animal products. They are also fundamentally flawed, as single parameters are compared, rather than an entire pattern, so when differences did occur between the cloned and non-cloned siblings, they were dismissed by the comment that the values were within the normal range typical of the breed or species. (Nanowerk Spotlight) The potential benefits of Nanofoods­ - foods produced using nanotechnology - are astonishing. Advocates of the technology promise improved food processing, packaging and safety; enhanced flavor and nutrition; 'functional foods' where everyday foods carry medicines and supplements, and increased production and cost-effectiveness. In a world where thousands of people starve each day, increased production alone is enough to warrant worldwide support. For the past few years, the food industry has been investing millions of dollars in nanotechnology research and development. Some of the world's largest food manufacturers, including Nestle, Altria, H.J. Heinz and Unilever, are blazing the trail, while hundreds of smaller companies follow their lead. Yet, despite the potential benefits, compared with other nanotechnology arenas, nanofoods don't get a lot of publicity. The ongoing debate over nanofood safety and regulations has slowed the introduction of nanofood products, but research and development continue to thrive - though, interestingly, most of the larger companies are keeping their activities quiet (when you search for the term 'nano' or nanotechnology' on the websites of Kraft, Nestle, Heinz and Altria you get exactly zero results). Although the risks associated with nanotechnology in other areas, such as cosmetics and medicine, are equally blurry, it seems the difference is that the public is far less apt to jump on the nanotechnology bandwagon when it comes to their food supply. 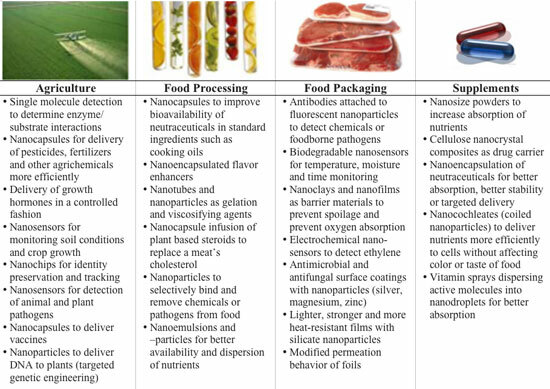 According to a definition in a recent report (Nanotechnology in Agriculture and Food) food is "nanofood" when nanoparticles, nanotechnology techniques or tools are used during cultivation, production, processing, or packaging of the food. It does not mean atomically modified food or food produced by nanomachines. It has been over ten years now since genetically modified Bt cotton was first commercialised. Since then it has been introduced or tested in more than twenty countries. The crop is a clear success for Monsanto, the leading Bt cotton company. But what has it meant for farmers? Today, a more complete picture is finally emerging of what is happening on the farm in many countries throughout the world. The issue of destruction of smallpox virus stocks has been heatedly discussed at the World Health Assembly (WHA) for several years, particularly following recommendations from a WHO advisory committee in 2004 to greatly expand dangerous smallpox research, including genetic engineering experiments. The 2006 WHA was unable to agree upon the text of a resolution on destruction of variola virus stocks, which are held in WHO authorized repositories in the US and Russia. Many developing countries, led by Africa, sought a resolution that established a destruction date for the virus (in June 2010), a prohibition on genetic engineering, annual substantive WHA review of virus research, and strengthened WHO oversight. The US refusal to consider fixing a new destruction date was problematic, and developing county offers of a compromise were also rejected. As a result, the WHO Executive Board is considering the draft resolution as it meets from 22-30 January 2007. NGOs are urging the Board to produce a strong resolution, given increasing indications that the US is expanding or intending to expand research with the smallpox virus and with smallpox genes. Every day the biotechnology companies bombard us with their publicity. We are told that eight million farmers throughout the world are already enjoying higher yields and lower production costs because of the benefits of genetically modified crops. And forever dangled before us is the carrot of far greater improvements in the future. We are promised that within a decade the biotech companies will have designed crops that will deal with drought, salinisation and all the other problems that we are likely to be facing as the result of global warming and climate change. But how true are these claims? Have hybrids and GM crops really reduced costs and increased yields? And is this kind of farming sustainable? It is often difficult to probe behind the hype of the biotech companies and to find out what is happening on the ground. In this edition, we have an extensive first-hand report from China about the real impact of hybrid rice, which now covers well over half of the area under rice cultivation in this vast country. Another article brings together reports from many different countries -- Burkina Faso, China, India, Indonesia, South Africa and the USA -- about the impact of Monsanto's genetically modified Bt cotton, which has now been on the market for a decade. The reports uncover profound concerns among the farmers and a worrying lack of transparency among the advocates of the new technologies. In both cases, it is clear that, even if the new crops bring short-term benefits (and this is not always the case), these can soon be outweighed by serious long-term problems in both the financial and agronomic viability of the new varieties. The biotech companies' response to the plethora of problems is to come up with another round of technical fixes. We are already hearing about the second -- and even third -- generation of GM crops engineered to deal with the problems created by the first generation. And so it will continue.? Not surprisingly, many farmers throughout the world are increasingly sceptical and are returning to the tried-and-tested practices of agro-ecological farming. Support is growing for the concept of food sovereignty -- the idea that communities have the right to define their own agricultural, pastoral, labour, fishing, food and land policies, in accordance with their own ecological, social, economic and cultural circumstances. In this edition, we talk to two different proponents of food sovereignty, one in Africa, one in India. Not surprisingly, their strategies are different, for they come from very different parts of the world, but they agree on one essential point -- the need for local farmers to be the ones who decide which crops they cultivate, what farming methods they use and how their produce should be marketed. In February advocates of food sovereignty from the five continents will be meeting in Mali for the Forum for Food Sovereignty. We are planning in 2007 a special issue on biofuels, the new craze that is sweeping through the world. The biotechnology companies are moving quickly to produce genetically modified crops especially tailored for the manufacture of ethanol and other biofuels. We would like to receive any comments or information that you, the readers, have on this topic. We plan to publish a list of the ten most useful documents on biofuels, and would welcome suggestions. A new study in the February issue of Current Anthropology explores how the arrival of genetically modified crops affects farmers in developing countries. Glenn Davis Stone (Washington University) studied the Warangal District of Andhra Pradesh in India, a key cotton growing area notorious for suicides by cotton farmers. In 2003 to 2005, market share of "Bt cotton" seeds rose from 12 percent to 62 percent in Warangal. Bt cotton is genetically modified to produce its own insecticide and has been claimed by its manufacturer as the fastest-adopted agricultural technology in history. Monsato, the firm behind Bt cotton, has interpreted the rapid spread of the modified strain as the result of farmer experimentation and management skill – similar to mechanisms that scholars cite to explain the spread of hybrid corn across American farms. But Stone's multiyear ethnography of Warangal cotton farmers shows an unexpected pattern of localized cotton seed fads in the district. He argues that, rather than a case of careful assessment and adoption, Warangal is plagued by a severe breakdown of the "skilling" process by which farmers normally hone their management practices. "Warangal cotton farming offers a case study in 'agricultural deskilling'," writes Stone. The seed fads had virtually no environmental basis, and farmers generally lacked recognition of what was actually being planted, a striking contrast to highly strategic seed selection processes in areas where technological change is learned and gradual. Interviews also provided consistent evidence that Warangal cotton farmers prefer trying new seeds – seeds without any background information whatsoever – to trying several strains on smaller, experimental scales and choosing one for long-term adoption. The problem preceded Bt cotton, Stone points out; its root causes are reliance on hybrid seed, which must be repurchased every year, and a chaotic seed market in which products come and go at a furious pace and farmers often cannot tell what they are using. Farmer desire for novelty exacerbates the turnover of seeds in the market, Stone argues, and seed firms will frequently take seeds that have fallen out of favor, rename them, and resell with new marketing campaigns. For instance, one recent favorite seed in several villages is identical to four other seeds on the market. Stone argues that the previously undocumented pattern of fads, in which each village lurches from seed to seed, reflects a breakdown of the process of "environmental learning," leaving farmers to rely purely on "social learning." Bt cotton was not the cause of this "deskilling," but in Warangal it has exacerbated the problem. "On the surface, [Warangal] appears to be a dramatic case of successful adoption of an innovation," Stone explains. "However, a closer analysis of the dynamics of adoption shows that the pattern some see as an environmentally based change in agricultural practice actually continues the established pattern of socially driven fads arising in the virtual absence of environmental learning." CHICAGO, Illinois, January 3, 2007 --/WORLD-WIRE/-- Dr. Samuel S. Epstein, professor emeritus of environmental medicine at the University of Illinois at Chicago School of Public Health and world renowned author, has announced the publication of his new book, "What's in Your Milk? ", a powerful expose of the dangers of Monsanto's genetically engineered (rBGH) milk, and the company's no-holds-barred conspiracy to suppress this information. rBGH (recombinant Bovine Growth Hormone) is a genetically engineered, potent variant of the natural growth hormone produced by cows. Manufactured by Monsanto, it is sold to dairy farmers under the trade name POSILAC. Injection of this hormone forces cows to increase their milk production by about 10%. Monsanto has stated that about one third of dairy cows are in herds where the hormone is used. *rBGH milk is contaminated by pus, due to the mastitis commonly induced by rBGH, and antibiotics used to treat the mastitis. *rBGH milk is chemically, and nutritionally different than natural milk. *Milk from cows injected with rBGH is contaminated with the hormone, traces of which are absorbed through the gut into the blood. *rBGH milk is supercharged with high levels of a natural growth factor (IGF-1), which is readily absorbed through the gut. *Excess levels of IGF-1 have been incriminated as a cause of breast, colon, and prostate cancers. *rBGH factory farms pose a major threat to the viability of small dairy farms. *rBGH enriches Monsanto, while posing dangers, without any benefits, to consumers, especially in view of the current national surplus of milk. Of still greater concern, based on 37 published scientific studies as detailed in the book, excess levels of IGF-1 in rBGH milk pose major risks of breast, colon and prostate cancers. Many prominent experts in the environmental field have endorsed the new book including Congressman John Conyers, Jr., Ranking Democrat, House Judiciary Committee, Mark Achbar, Executive Producer of the multiple prize-winning documentary The Corporation, Ronnie Cummins, National Director, Organic Consumers Association, and Dr. Joseph Mercola, founder of the world’s most visited natural health website. The book is a unique resource on rBGH milk. It presents Dr. Epstein's trailblazing scientific publications since 1989, which have played a major role in influencing other nations, including Canada, 24 European nations, Norway, Switzerland, Australia, New Zealand, and Japan to ban rBGH milk. The book also presents: the author’s editorials and letters to major newspapers, and correspondence with the FDA, Congressman John Conyers, and other key members of Congress and the Senate. Epstein also details evidence of interlocking conflicts of interest between Monsanto and the White House, the American Medical Association and American Cancer Society. He also details evidence of Monsanto's white collar crime; the suppression and manipulation of information on the veterinary and public health dangers of rBGH milk; and evidence of Monsanto's "Hit Squad," which attempted to stifle and discredit him. Monsanto's corporate recklessness, compounded by FDA's complicity and refusal to require labeling of rBGH milk, more than justify the rejection of any assurances of its safety. Of further interest is the critical relevance of this information to the ongoing growing concerns and debate on genetically engineered foods, including irrefutable evidence discrediting the "trust us" safety assurances of Monsanto, and other industries. The book also presents resource materials, including listings of national and international anti-biotech, public health, veterinary and animal rights activist groups. Also listed are rBGH-free U.S. dairy producers, such as Horizon Organic, and Swiss Valley Farms. What's In Your Milk’s critical message to consumers is, BOYCOTT rBGH HORMONAL MILK IN FAVOR OF CERTIFIED ORGANIC MILK. The book is available from Trafford Publishing, www.trafford.com/06-0676, or by calling Trafford’s Order Desk at 888-232-4444 or 250-383-6864, and subsequently at amazon.com and major bookstores everywhere. Cost of "What's in Your Milk" is $24.95 USD For overseas orders, contact national Amazon sites or other major bookstores and on-line retailers. GBP14.35 GPB, 20.49 Euros Dr. Epstein is professor emeritus of environmental medicine at the University of Illinois at Chicago School of Public Health, and Chairman of the international Cancer Prevention Coalition. He is the author of 270 scientific publications, and author or co-author of 12 books, including the prize winning 1978 The Politics of Cancer, the 1995 The Safe Shopper's Bible, and the 2005 Cancer-Gate: How to Win the Losing Cancer War. Dr. Epstein has been the recipient of many awards, including the 1998 Right Livelihood Award, the Alternative Nobel Prize, for his "incomparable contributions to cancer prevention, and for his leadership role in warning of the dangers of rBGH milk." Dr. Epstein has also received the the 2000 Project Censored Award. In 2005, Dr. Epstein was awarded the Albert Schweitzer Golden Grand Medal "for Humanitarianism, and International Contributions to Cancer Prevention." Industry-funded International Service for the Acquisition of Agri-biotech Applications (ISAAA) claims of increases in the growing of genetically modified (GM) crops and overwhelming acceptance of this risky new technology is flawed. Statistics from ISAAA have been exaggerated in the past, according to a report released this month by Greenpeace International. ISAAA claimed that in 2005 Romania grew 125000 hectares of GM soy, while the Romanian government put the area at only 87000 hectares. In 2006, ISAAA claimed that Iran was growing GM crops commercially, although Iran is neither growing nor has it approved any GM crops on a commercial scale. According to ISAAA, of the 25 European Union states six are growing GM crops. It is silent on the banning on cultivation of GM soy by Romania, the ban on GM maize by Austria and that seven European countries have banned one or more GM crops. According to ISAAA, China has 3.5 million hectares under GM crop cultivation. Nevertheless, Kraft Foods, the world’s second largest food producer, has committed itself to supply China with GM-free food from January 1 2007. The Chinese government’s biosafety committee has also called for more data and assessment about the safety of GM rice, so delaying a decision on its commercial approval for at least a year. Following the discovery in 2006 that significant quantities of USA long grain rice were contaminated with an unapproved GM variety, the Rice Producers of California and a major rice mill in the state have called for a ban on the growing of GM rice, including in field trials. The world's largest rice processor, Ebro Puleva, has also committed to being GM-free and rice traders in Thailand and Vietnam, the world's two largest rice exporting countries, have done the same. In India, which ISAAA says is the leading GM crop grower in Asia, the Supreme Court has placed a temporary ban on all field trials of GM crops. ISAAA claims Brazil has 11.5 million hectares under GM crop cultivation but Brazil continues to resist GM industry attempts to get approval for GM maize. Even in South Africa, where ISAAA says there has been a 180% increase in the area under GM crop cultivation, the regulatory authority for GM applications last year rejected an application for experiments with GM sorghum - because they feared contamination of local sorghum varieties. And towards the end of 2006, the South African Wine Industry Council objected to an application for the use of GM yeast in winemaking. Research in South Africa and worldwide is showing that GM crops have none of the benefits which the GM industry persistently promises. A joint seven-year study by Chinese and United States researchers found that Chinese farmers growing GM cotton lost money. The researchers, from the Centre for Chinese Agricultural Policy, the Chinese Academy of Sciences and Cornell University in the United States, found that farmers who had planted Bt cotton initially cut their pesticide use by more than 70% and had earnings 36% higher than those planting conventional cotton. But after that, the farmers growing Bt cotton had to spray as much pesticide as farmers growing conventional cotton. This resulted in them earning 8% less than conventional farmers because the Bt cotton seed was triple the cost of conventional cotton seed. After seven years, other insects had increased so much that the farmers growing Bt cotton were having to spray their crops up to 20 times per growing season. A study of GM cotton farmers in Makhathini Flats in KwaZulu Natal by University of KwaZulu Natal researchers, found that cotton yields in the area were more or less the same before and after the adoption of GM cotton. Based on their discussions with those familiar with pesticide application in the area, the researchers suggested a similar scenario with pesticide use as was the case in China. On the 15 June 2006, the Executive Council (EC), a statutory body established by the Genetically Modified Organisms Act comprising six government departments (science and technology, agriculture, trade and industry, health, labour, and environmental affairs and tourism) turned down the Council for Scientific and Industrial Research's (CSIR) application to conduct laboratory and greenhouse experiments on genetically modified (GM) sorghum. This decision was taken against the backdrop that Africa is the centre of origin for sorghum where (including in South Africa) a large number of sexually compatible weeds, wild relatives strains and races of cultivated sorghum occur. In this regard, the EC cited concerns regarding the risks "pertaining to possible impact as a result of gene flow on bio-diversity". The EC specifically requested that the CSIR characterise sorghum species in South Africa with particular regard to examining sexual compatibility, geographic distribution, climatic requirements and importance to bio-diversity, including nutritional characterisation of the different species of sorghum in S.A.
Derek Hanekom, the deputy science and technology minister said in August 2006 that the South African government might well reconsider its stance if the CSIR could demonstrate to the council that the sorghum is suitably contained. In September 2006, an application was re-submitted in the name of the CSIR Biosciences to conduct an assessment of GM sorghum that has been engineered to express a high-lysine storage protein from barley. This new application provides for the use of a level 3 containment facility. Upon examination by the ACB, not only does the application fail to address the various concerns raised by the EC, we have found it to be extremely sketchy and based on wholly inadequate, erroneous and unsubstantiated scientific information. It appears as if the aim of the application is to forge ahead with the GM sorghum experimentation at all costs, including the wholesale contamination of Africa’s prized sorghum heritage. Still knocking on a closed door…. Despite successful litigation by South African based NGO, Biowatch South Africa regarding the public's right to information regarding GM regulation and risk assessment data, the public continues to be denied vital information to conduct a proper assessment, including such basic information as the molecular description and characterisation information. The ACB has not been able to make a full and complete assessment of the application since the bulk of the pertinent information is contained in Annexures, copies of which were denied to us. The engagement by the public with the applicant needs to be made on the basis of complete and accurate information being made to it and in accordance with the court order made in the Biowatch litigation. Nevertheless, what the applicants could not hide from public scrutiny is that they are unable to provide any references to scientific peer reviewed journals of the various safety claims they make regarding the impacts of their GM sorghum on the biosystem. Indeed, the applicants state that the opportunities for out-crossing to cultivated sorghum and to wild relatives of sorghum are highly unlikely (page 2) because of the level 3 containment facility that is proposed for the release. The distinct impression gained from the application is that s impacts of the release of the transgene are negligible - a view not supported by the published literature. During February 2005 Schmidt and Bothma reported on a crop-to-crop gene flow risk assessment study conducted in South Africa, with Sorghum bicolor subsp. bicolor to estimate the impact of transgenic sorghum in (South) Africa. This study was funded by the Agricultural Research Council at which Bothma is employed. The field trial was conducted at on the 4000-ha ARC research farm Roodeplaat close to Pretoria. A central sorghum field (30 x 30 m) was planted with male fertile donor plants and surrounded by eight arms planted with male sterile recipient plants at a distance of 13 to 158 m from the central field. Gene flow was found to be high within the first 40m and whilst low beyond this point, regardless gene flow was detected even at the 158 m point. In South Africa we have the presence of fully fertile crop wild relatives and the weedy relative johnsongrass [S. halepense (L.) Pers. ], which may form hybrids with crop sorghum. Johnson grass is classified as one of the world's most noxious weeds. The authors concluded that the fact that gene flow takes place and the presence of these weedy and wild relatives provides strong evidence that introgression of genetically modified-(GM)-sorghum into crops and crop wild relatives will take place once GM sorghum is deployed. The South African Sorghum gene flow study raised very serious concerns of introgression of GE-sorghum into wild relatives. The South African government is obliged in terms of its national and international obligations under pertinent multilateral environmental agreements such as the Cartagena Protocol on Biosafety, to protect biodiversity, refuse the application. Some activities just cannot be permitted and should be regarded as NO GO options, such as the release of GM sorghum into greenhouses. The risks posed by GM sorghum to sorghum wild and weedy relatives cannot be tolerated at all and the granting of a permit will be tantamount to a licence to taint Africa's heritage. Ultimately, Wambugu et al's ABS project is being developed for commercial release and will have to undergo field trials. If the original objection of the EC made on 15 June 2006 was based on concerns regarding containment and possible adverse effects on local varieties, any further development or re-consideration of the application must be forestalled by this very concern itself. Containment now in a level 3 containment facility will not negate these concerns for field trials and the risks to local varieties will remain. Hanekom, D. (2006) Cautiously sowing the seeds of change. 2 August. Business Day. Es patética la cantidad de falsedades que desde autoridades a empresarios agropecuarios y empresas trasnacionales nos lanzan a la cara sobre el alza vertiginoso del precio de la tortilla y sus posibles soluciones. Unos para justificarse, otros para ver que más pueden ganar. ¿Qué se puede decir cuando los mismos que producen el alza artificial de precios del maíz, a través de la especulación y el acaparamiento, como por ejemplo la trasnacional Cargill, se sientan con el gobierno y "avalan" que el aumento de la tortilla sea "solamente" de 40%? ¿O que el gobierno anuncie como paliativo que ahora se exceptuarán de arancel de importación a 2 millones 850 mil toneladas de maíz, cuando desde la firma del Tratado de Libre Comercio de América del Norte (TLCAN) nunca se han cobrado los aranceles de importación al maíz que México tenía derecho a cobrar según el propio tratado? Se han importado desde entonces entre 5 y 8 millones de toneladas anuales libres de arancel, una inmensa sangría al erario de la que se han beneficiado las grandes empresas de distribución de cereales como Cargill y Archer Daniel Midland, y los grandes industriales que usan el grano para harina y forrajes, como Maseca, Minsa, Bachoco, Pilgrim's Pride, Tyson. Este flujo de importación no solamente compitió deslealmente con la producción nacional, sino que además causó la impune contaminación transgénica del maíz campesino, dañando uno de los mayores acervos económicos, culturales e históricos del país y del mundo. Es grave que la distribuidora pública Diconsa -- que por la enorme capilaridad para llegar a las poblaciones campesinas a través de sus más de 22 mil tiendas rurales fue identificado como unas de las principales fuentes de contaminación transgénica-- anuncie que romperá su ya insuficiente compromiso de 2003 de comprar maíz solamente a productores nacionales y que volverá a importar. Pero aún más cínico en medio de tanta falacia es que las trasnacionales de los transgénicos aprovechen para decir que el maíz transgénico sería la solución "de fondo" para aumentar la producción de maíz en México. Afirmación totalmente arbitraria, ya que el maíz transgénico produce igual o menos que el convencional según múltiples datos oficiales de Estados Unidos, el mayor productor mundial de maíz y de transgénicos. En esta ocasión la letanía sale como declaración del Consejo Nacional Agropecuario (CNA), asociación integrada por los grandes productores agropecuarios y agroindustriales de México junto a las megaempresas nacionales y trasnacionales relacionados con los agronegocios. No es extraño, cuando entre sus asociados están Monsanto, Syngenta y Agrobio México (que agrupa a las trasnacionales de agrotransgénicos), además de Cargill, Grupo Minsa, Bachoco, Pilgrim's Pride, Tyson. Entre los logros históricos en los que el CNA se adjudica "participación activa", están la modificación del artículo 27 (que abrió la puerta para el proceso de privatización de las tierras ejidales y comunales); la firma de TLCAN y la desregulación de la Secretaría de Agricultura. Ahora quieren agregar a esta impresionante lista de devastación, la presión para lograr la siembra de maíz transgénico en México, su centro de origen. Lo que ocultan las declaraciones de estos (no tan) nuevos señores feudales del campo mexicano es que nada menos que el 85 por ciento de los productores de maíz en México son campesinos, cultivan en predios de menos de cinco hectáreas y no dependen de ellos. Manejan una enorme diversidad de semillas adaptadas durante siglos a diferentes climas y geografías, lo que, al contrario de las semillas uniformes industriales, son útiles en las condiciones marginales donde los conquistadores y anteriores señores feudales los empujaron a vivir, primero a sangre y fuego y más tarde a punta de urbanización salvaje y otros despojos. Estos tercos y dignos campesinos y campesinas indígenas que son los creadores de las semillas --con las que especulan ahora los dueños del dinero-- siguen usando mayoritariamente sus propias semillas, base de su alimentación y autonomía. La introducción legal y masiva de transgénicos los condenará a la contaminación, a juicios por "uso ilegal de genes patentados" y más tarde a la bioesclavitud de comprar semillas a las trasnacionales cada año. Finalmente, a desaparecer como campesinos en la competencia con la avalancha de maíz industrial y la batería de políticas anti-campesinas y anti-indígenas, condenándolos, como al resto de la población, a consumir tortillas de maíz transgénico; harinizado, no nixtamalizado; de mala calidad, con menor valor nutritivo y riesgos para la salud. Si el problema que vivimos fuera de volumen de producción (un punto a debatir, ya que la producción actual de maíz es suficiente e incluso excedentaria para toda la población, pero no para la producción industrial masiva de animales o para alimentar automóviles con biocombustible a base de maíz), existen muchas alternativas para aumentar la producción de maíz en México sin uso de transgénicos, aprovechando la enorme diversidad y riqueza histórica de saberes y semillas nativas, en complementación horizontal con la producción de semillas en instituciones públicas y sin patentes. Por ejemplo, las propuestas de Antonio Turrent y José Antonio Serratos, que plantean que México puede duplicar la producción actual de maíz con estrategias multifáceticas y descentralizadas, sin transgénicos ni trasnacionales. Pero la realización de este tipo de propuestas afirmarían la soberanía alimentaria y la autonomía campesina e indígena, y eso sí, es un problema de fondo para que los señores feudales (nacionales y transnacionales) puedan seguir especulando y lucrando con las semillas que han robado de la creación campesina. Boletín 0703 / 18 de enero de 2007 "En México la industria biotecnológica pretende engañar a la sociedad y convencer a las autoridades para aprobar la siembra de transgénicos en México, prometiendo altos rendimientos y disminución de uso de agrotóxicos, lo que no han comprobado ni siquiera en Estados Unidos, de acuerdo a un reporte de abril del 2006 del propio Departamento de Agricultura (USDA) de ese país (1)", dijo Areli Carreón, de la campaña de transgénicos de Greenpeace México. "Los transgénicos no son una solución para la producción de maíz en México porque no contamos con las condiciones de producción que requieren para prosperar, esto es, amplias extensiones de monocultivo altamente tecnificado, con riego y con el uso de un paquete tecnológico que los campesinos mexicanos no pueden costear. Para que se cumpliera la promesa de elevar los rendimientos de maíz a los niveles de los Estados Unidos con estas semillas tendríamos que modificar nuestra orografía, nuestra disponibilidad de agua, la tenencia de la tierra y cambiar nuestra cultura, forjada alrededor del maíz. En pocas palabras tendríamos que dejar de ser México". La verdadera solución para mejorar la producción del maíz requiere de un cambio de fondo en las políticas públicas para el campo y la producción de alimentos, como hemos coincidido ambientalistas, organizaciones campesinas, indígenas, sociales y científicos e investigadores. Antes que permitir la siembra de transgénicos, el gobierno de México debe invertir en proteger y cultivar nuestra biodiversidad de maíz está perfectamente adaptada para resistir a plagas, sequía, inundación, viento, alcalinidad o acidez de los suelos. Esta riqueza genética es un patrimonio exclusivamente mexicano que debemos proteger y aquilatar. "¿Por qué vamos a apostarle a una tecnología riesgosa para la salud y el medio ambiente, propiedad privada de unas cuantas corporaciones transnacionales que cobran regalías por su uso, que incrementa el uso de agrotóxicos dañinos y que es rechazada por los consumidores de mercados globales tan importantes como Europa, China, Japón y Australia? ¿Debemos permitir la contaminación de nuestra riqueza genética de maíz, sólo porque es un buen negocio para unas cuantas corporaciones transnacionales? ", preguntó Carreón. "Hoy aparece el reporte anual de ISAAA (International Service for the Acquisition of Agri-biotech Applications) dando cifras alegres inverosímiles sobre el supuesto crecimiento del uso de los transgénicos en el mundo. Estos datos se sustentan sólo en información provista por las propias compañías dueñas de esta tecnología, interesadas en impulsar su uso. No son una fuente imparcial y fiable de información. Las promesas falsas, el engaño y la falta de información sobre los transgénicos son las herramientas con las que las corporaciones biotecnológicas pretenden hacer jugosos negocios en México, poniendo en peligro de contaminación irreversible nuestro país, centro de origen y biodiversidad del maíz", dijo Carreón. El documento Reacción global contra los transgénicos en 2006, publicado hoy por Greenpeace Internacional, provee evidencia sólida del rechazo global de agricultores, consumidores y gobiernos a la siembra de transgénicos. Este documento fue presentado en el contexto del lanzamiento del reporte anual de ISAAA (International Service for the Acquisition of Agri-biotech Applications), organización financiada por la industria agroquímica. "Hay evidencia irrefutable de que gobiernos, agricultores y consumidores alrededor del mundo reconocen que los transgénicos son impredecibles, inviables o sin duda peligrosos", dijo Jeremy Tager, de Greenpeace International, "La reacción de los mercados globales al reciente escándalo de contaminación del arroz con transgénicos es de grandes proporciones ya que algunos países han decidido prohibir el cultivo de todos los transgénicos en sus territorios. Rumania, por ejemplo, que tenía 85 mil hectáreas sembradas con soya transgénica en el 2005, reducirá esa superficie a cero en este año"
1. The First Decade of Genetically Engineered Crops in the United States USDA, abril, 2006, página 9 elaborado por Jorge Fernández-Cornejo y Margriet Caswell. 2. Vea el Reporte Reacción global contra los transgénicos en 2006 aquí. Honolulu, HI - Earthjustice announces a new video entitled Islands at Risk – Genetic Engineering in Hawai'i. This half-hour program explores a subject that has received little attention in the media but involves a potential public health and safety issue of enormous consequence. Focusing on local experiments with genetically modified organisms (GMOs), the program features local Hawai'i farmers, teachers, legal and medical experts, and community activists who share their perspective on the genetic engineering of crops and the patenting of life forms. "Hawai`i has been called the GMO testing capitol of the world because, in the past ten years or so, we have had here more than 2,000 field tests of experimental genetically-engineered crops in more than 6,000 locations around our small state," says Earthjustice attorney Paul Achitoff in the video. "And this is more than any other place in the world." Earthjustice has won recent lawsuits in federal and state courts challenging the introduction of these experimental crop tests in the islands without first assessing the environmental and human health impacts. Islands at Risk – Genetic Engineering in Hawai'i looks at some of the possible impacts, including allergic and immune system responses from exposure to biopharmaceutical crops - both in humans and in Hawai'i's endangered species - and contamination of regular food crops such as papaya, taro, coffee and corn with genetically modified versions of those crops. "Some people say it's a tiny risk," says Kaua'i taro farmer Chris Kobayashi in the video, "but it's a huge risk." Some of that risk is described by medical doctor, public health officer and World Health Organization consultant Dr. Lorrin Pang of Maui who calls for more oversight of the genetic engineering industry. Regarding the substances introduced into the cells of GMO plants, Pang states, "These things are not benign. These things are quite unknown. The kinds of studies we do for drugs and vaccines are exactly what genetically-engineered food needs." Aside from health issues, the video focuses on the economics of the current state government policy of subsidizing the biotech industry. Local organic farmers growing coffee, papaya, taro and corn point out that genetically engineered produce does not command the export market prices of conventionally-grown and organic produce. Many countries either refuse to import GE food or require labeling. "We're going in the wrong direction for economic development," says international legal expert Mililani Trask. "We need to re-assess it." Trask also discusses the practice of patenting Hawaiian life forms, calling it a form of bio-piracy. "We Kanaka Maoli (Native Hawaiians) are claiming our inalienable right to the biodiversity of our lands. This is the heart of what we are in terms of our survival, our ability to maintain our health." The recent attempt by the University of Hawai'i to patent taro, honored as an ancestor of the Hawaiian people, is recounted in the video by Moloka'i hunter and Hawaiian activist Walter Ritte. His and others' successful efforts to persuade the UH to drop their patents on new hybrid Hawaiian taro varieties was a signal to the whole biotechnology industry, Ritte says in the video, that "you cannot own our ancestors." The issue of food security and the world's future ability to feed itself is discussed by local farmers Una Greenaway and Nancy Redfeather. "By choosing the path of genetically-engineered agriculture, we are narrowing significantly the amount of seed varieties that are available to the farmer today," says Redfeather. The video ends with a vision of Hawai'i as a model for sustainable tropical agriculture. "Hawai'i is a niche specialty market for amazing things: coffee, pineapple, banana, flowers. We can actually support ourselves with this," says mixed organic farmer Melanie Bondera. Pero la resistencia social a los alimentos transgénicos les está complicando de distintas formas. Desde la proliferación de “zonas libres de transgénicos” locales y boicots de los consumidores a los alimentos transgénicos hasta la aprobación de leyes nacionales e incluso locales sobre el etiquetado de trasngénicos, el escenario regulatorio para la biotecnología agrícola está en constante movimiento, lo cual tiene consecuencias directas para las bases de referencia empresariales. La situación es especialmente problemática para el pequeño cartel que controla el comercio mundial de granos. Pero en lugar de abandonar los cultivos transgénicos frente a la referida resistencia, el grupo está saboteando agresivamente todos los procesos por los cuales los gobiernos podrían regular autónomamente el comercio de alimentos transgénicos para humanos o animales. Hacen esto conjuntamente con las compañías de semillas transgénicas y de plaguicidas, poniendo presión toda vez que pueden –en foros multilaterales y, cada vez más, a través de las vías bilaterales. La utilización creciente de los espacios bilaterales como una forma de ejercer presión política no es exclusiva de la biotecnología agrícola. Ocurre en todos los sectores, especialmente a través del aumento explosivo de los tratados de libre comercio (TLC), que llenan el vacío dejado por la ruptura de las conversaciones comerciales mundiales en la Organización Mundial de Comercio (OMC). A través de los tratados bilaterales y de las estructuras de supervisión que crean las empresas, éstas logran tener acceso directo – por detrás de bambalinas – a los gobiernos, contando con el respaldo del poder político de la bandera de su país de origen. Los acuerdos resultantes sirven inevitablemente a dos necesidades básicas de las empresas: fortalecer la propiedad sobre sus bienes (a través de la propiedad intelectual y los derechos de los inversionistas) y lograr normas regulatorias que se adapten a sus intereses (a través de normas de salud y de seguridad). Este informe analiza cómo y por qué las empresas se apoyan cada vez más en el ámbito del comercio bilateral para dar forma a las políticas regulatorias en todo el mundo sobre la alimentación transgénica para seres humanos y animales. Group Seeks Ban on "Living Machines"
BROOKLIN, Canada, Jan 20 2007 (IPS) - Anyone with a laptop and a mailbox could create their own bacteria or virus, for good or ill, thanks to a rapidly evolving new technology called synthetic biology, activists warn. Companies are jumping into synthetic biology and beginning to commercialise and patent bits of constructed DNA and other molecules that can be used to create living machines in the near future, the Canadian-based ETC Group warn in their report "Extreme Genetic Engineering: An Introduction to Synthetic Biology" which will be released at the World Social Forum (WSF) in Nairobi, Kenya Saturday. "Today, scientists aren't just mapping genomes and manipulating genes, they're building life from scratch," said Pat Mooney, the executive director of ETC Group. "And they're doing it in the absence of societal debate and regulatory oversight," Mooney said in a statement. Although related to biotechnology, synthetic biology combines biology and engineering to build entirely new biological entities from the ground up. In the far future, some proponents of the new technology believe synthetic biologists could construct DNA molecules and other molecular bits to grow an acorn that would become an oak tree that grows into the perfect shape of a dining room table. More practically, researchers are using the technology to develop cheaper biofuels and drugs, remediate climate change and much more. "Synthetic biology has the potential to transform society," says Robert Holt, a research scientist at the Genome Sciences Centre of the British Columbia Cancer Research Centre. However, it is early days and hard to say whether important products of this new technology are years or decades away, Holt told IPS. There are no completely new synthetic organisms yet. Scientists have recreated a polio virus and a bacteriophage -- the latter took just two weeks in 2004. A bacteriophage is a very simple life form, with just 5,000 base pairs in its genetic map. The human genome has three billion pairs. Bacteria have around four million base pairs and the world's first de novo bacterium is expected to be announced some time this year. "This will likely be self-replicating like other bacteria," said Hope Shand of the ETC Group from her office in North Carolina. Self-replication poses special risks, especially in the environment, and for this reason the ETC Group wants an immediate global ban on the environmental release of these synthetic organisms. The technology to do synbio is now accessible all around the world, Shand told IPS. The science has evolved such that using a laptop computer, published gene sequence information and mail-order synthetic DNA, just about anyone has the potential to construct genes or entire genomes from scratch -- including those of lethal pathogens. Each year students from around the world compete at the Massachusetts Institute of Technology's (MIT) International Genetically Engineered Machine to create new living things. Last year students collected various DNA components from scientists and from MIT's "biobricks" genetic repository, placed them into a string of DNA, and inserted this into bacteria to create a new strain of E. coli that smells of mint and bananas. Those biobricks, by the way, are also freely available on-line to anyone. "The pace of development is astonishing. In few years scientists will be able to synthesise new viruses and bacteria," she Shand said. Bioweapons and bioaccidents are cause for real worry. This rapid development "increases the incremental risk for biological attack", writes Roger Brent, director and president of the Molecular Sciences Institute in Berkeley, California in an article titled "Power and Responsibility" published late last fall by MIT. And it is also likely to spawn "DNA hackers" at the high school and undergraduate engineering levels in the future, Brent suggests. However, Brent would like to see the U.S. government spend 50 million dollars by 2010 on open source standard parts, genes encoding enzymes relevant to carbon fixation, alcohol synthesis, energy storage materials, plant derived materials and functions, and chemical remediation and recycling. But strong technical defences and social norms, including punishment of pathogen-makers, would have to be in place, he writes. Governments have not even begun to consider how to regulate the new technology, says Shand. "We need a broad and open discussion between civil society, governments and the scientific community about the benefits and risks," she said. Patent, intellectual property issues and the privatisation of life forms also need to be discussed, she said, adding that "self-regulation by the scientific community and industry is not good enough." Last year, 38 civil society organisations released an open letter calling for an international discussion and review of the social, ethical and economic implications of synthetic biology. "There will be a lot of people in Nairobi (attending the WSF) who will be eager to learn about this new technology," Shand said. “El año pasado, 38 organizaciones de la sociedad civil rechazaron la propuesta de que la biología sintética debía ‘autorregularse’, hecha por un puñado de biólogos trabajando en ello” informó Kathy Jo Wetter del Grupo ETC. “Debe ponerse en primer plano el debate amplio sobre las implicaciones sociales, económicas y éticas de la biología sintética, debate que no debe restringirse a los temas de la inocuidad o la bioseguridad”. Las herramientas para sintetizar los genes y genomas son muy accesibles y están sofisticándose rápidamente. El nuevo informe del Grupo ETC concluye que no es suficiente con regular la biología sintética a nivel nacional. Las decisiones en torno a ello deben tomarse en el contexto global, con gran participación de la sociedad civil y los movimientos sociales. En congruencia con el Principio de Precaución, el Grupo ETC insiste en que por lo menos debe prohibirse inmediatamente la liberación en el ambiente de los organismos sintéticos de novo hasta que haya un amplio debate social y un fuerte control por parte de los gobiernos. El texto de ETC Ingeniería genética extrema: Introducción a la biología sintética podrá descargarse sin costo, en español, a partir de febrero en www.etcgroup.org. Industry's annual review of genetically manipulated (GM) crops shows they stalled a long time ago. An International Service for Acquisition of Agro-biotechnology Applications report was published today. (www.isaaa.org/Resources/Publications/briefs/default.html) "ISAAA makes unsupported claims, inflates its figures and ignores the negative impacts of GM crops," says Gene Ethics Director, Bob Phelps. "For instance, Iran is again wrongly listed as growing 50,000 hectares of commercial GM rice, which is not approved and is not being grown," he says. "Romania is also listed as growing 100,000 hectares of GM soybean but this crop is now banned and the country is being decontaminated to return it to GM-free," he says. "ISAAA claims commercial GM crops are a global industry but their own figures show 99% grew in just eight countries last year - USA 53.5%; Argentina 17.6%; Brazil 11.3%; Canada 6%; India 3.7%; China 3.4%; Paraguay 2%; and South Africa 1.4%," he says. "The range of GM crops also stalled in 1996 when four broad-acre commercial crops - soy, corn, cotton and canola - were first grown. Not one has been added since," he says. "And these crops still have just two commercial GM traits - tolerance to being over-sprayed with weed killer and making their own insect toxins. Both add more chemicals to our environment and foods," Mr Phelps says. "Australian governments would be foolish to allow commercial GM canola into Australia because, even in this weak field, GM canola runs a distant last since 1999," he says. "The report emphasizes that 10.3 million farmers grew GM crops in 2006, but this is just 0.7% of farmers world-wide. And just 600,000 farmers grew 85% of all GM crops on industrial farms in North and South America. Small third world farmers are misused as fodder in the ISAAA's PR war," he says. "GM technology has been overtaken by smarter, more precise and successful genetic science - genomics and proteomics - in tandem with traditional breeding,' he says. "The ISAAA is flogging a dead horse," he says. "Shoppers and farmers will ensure that genetically manipulated seeds, crops and foods are rejected around the world," Mr Phelps concludes. Amsterdam, 18 January 2007: A summary of global reaction against genetic engineering in 2006, released by Greenpeace today, provides solid evidence that resistance to genetically engineered (GE) crops continues to grow among farmers, consumers and governments. The Greenpeace summary was released hours before the expected release of an annual report by the International Service for the Acquisition of Agri-biotech Applications (ISAAA), a think-tank supported largely by the agrochemical industry. "There is irrefutable evidence (1) that governments, farmers and consumers throughout the world recognise that genetic engineering is unreliable, unviable or downright dangerous," said Jeremy Tager, campaigner for Greenpeace International, "Market reaction to the recent rice contamination scandal was of near epidemic proportions; some countries are banning GE altogether. Romania, for instance, which had 85,000 hectares planted with GE soy in 2005, will drop to zero this year, in keeping with a new government policy banning the cultivation of GE soy." The Rice Producers of California and a major rice mill in the state, Sunwest Foods, have called for a ban on any cultivation of GE rice (including field trials) in California. Large sectors of the rice industry, including Ebro Puleva, the world's largest rice processor, committed to being GE-free. Rice traders of two of the largest rice exporting countries, Thailand and Vietnam, have signed an agreement that commits them to being GE-free, capitalizing on new market opportunities that have opened up as a result of the contamination of US rice supplies with Bayer's GE rice. The Chinese Biosafety Committee once again requested further data and assessment on the safety of GE rice, thereby again delaying a decision about commercial approval, even though the varieties have been under active consideration by the committee for over two years. The All India Rice Exporters' Association formally requested that the Indian government prohibit field trials of GE rice in basmati rice-growing states. Rice farmers in India burnt down GE-rice test plots that could potentially contaminate their own fields. Rakesh Tikait, national spokesperson for the Bharathiya Kisan Union, (BKU) one of the largest farmers' groups in India, was straightforward in his condemnation of GE, saying, "The threat to farmers' livelihoods in India is clear. Examples from across the country of Bt cotton failures show that this technology is unsafe for humans and the environment, and that it can neither be controlled nor regulated. We consider the threat serious enough to warrant the destruction of test fields of GE rice to stop its introduction and protect ourselves." Chip Struckmeyer, a rice farmer from California, agreed, "US rice producers took a big hit financially when rice was found to be contaminated with unapproved varieties. It's clear our customers don't want genetically engineered rice. Why on earth would we plant it?" "ISAAA might claim that genetic engineering has been a success, with consistent increases in global acreage. But the global reaction to the Bayer rice contamination scandal of 2006 provides a sharp contrast to the rosy picture they're painting. It is overwhelmingly evident that the GE industry will not be able to convince consumers to eat GE rice, wheat, aubergine, or anything else. With governments unwilling to allow it, farmers unwilling to grow it and consumers unwilling to buy it, it is clear that genetic engineering has no place in our future," concluded Tager.